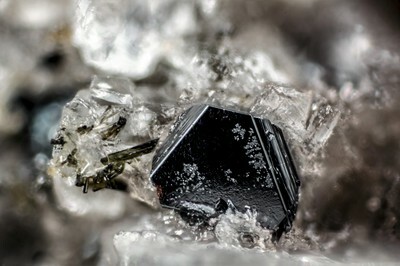 A beautiful tabular, trigonal crystal of zirconolite, dark brown to black in color, on colorless sanidine crystals and in association with green pyroxene crystals. The SEM-EDS analysis revealed the presence of Zr, Ti, Ca, and minor Fe. Collection and photo by Gianfranco Ciccolini.